Resembling a light tank with its sleek body and robust armament, the boyevaya mashina pekhoty (infantry combat vehicle) quickly imprinted itself on transport and firepower lexicon as the BMP. On November 7, 1967, during a parade marking the 50th anniversary of the 1917 October Revolution, several unknown military vehicles rumbled onto the cobblestones of Moscow’s Red Square to the great excitement of onlookers. Nuclear weapons, the rapid mechanization of ground forces and increasing large-scale military manoeuvres in the second half of the 20th century forced theorists and designers to look for a boost to the infantry’s combat muscle. The main belligerents of WWII had churned out new armoured carriers as the mainstay of infantry transport. These could protect personnel from small arms fire and shell bursts but were generally only armed with machine guns. With opposing forces bristling with tanks and anti-tank weapons and the likelihood of infantry operations in areas of radioactive and chemical contamination, the classic open-topped carrier neither protected the troops nor offered effective fire support. The BMP-1 had what the Soviet infantry needed. It carried an 11-man rifle detachment which exited the carrier via a rear door, a configuration that was soon to be copied in infantry vehicles around the world. The star feature of the BMP-1 was its weaponry, far deadlier than rival designs. The turret carried the new 73 mm smoothbore 2A28 Grom (“Thunder”) semi-automatic gun. Firing rocket-assisted PG-9 anti-tank rounds to a range of 1,300 metres, the cannon could knock out the main battle tanks of NATO members, the M60 (US), the Leopard (West Germany), the AMX-30B (France) and the Chieftain (UK). 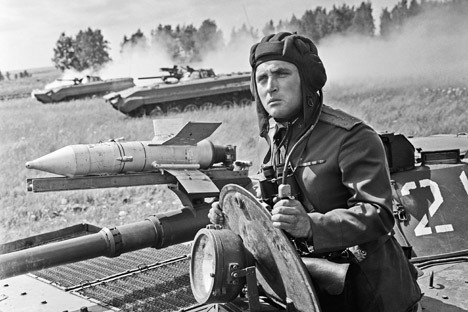 The vehicle also carried 9K11 Malyutka (“Baby”) radio-controlled anti-tank missiles which had a range of 3 kilometres and could destroy armoured vehicles and fortifications. The BMP could take a hit as well as deal one. Offering all-round protection against 7.62mm armour-piercing rounds, the forward hull could withstand 23 mm automatic fire. Meanwhile, the air filtration system shielded the crew from radioactive or chemical contamination, and the BMP was also amphibious, propelled through water by its tracks at up to 7 km/h. Combining these features in one vehicle now enabled the infantry to attack behind tanks under cover of its own armour. Similar infantry combat vehicles appeared in other armies and are now an integral item. The BMP-1’s baptism of fire came in the 1973 Yom Kippur War, when Egypt and Syria already had several hundred units. Because of the poor tactical training of the Arab coalition forces, however, it was used much like old-style carriers, since troops did not know how to dismount close to the enemy or advance in tandem with tanks. In the 1982 Lebanon War Syrian mechanized infantry used the BMP-1 to much better effect. In one famous ambush, Syrian intelligence platoon commander Mazin Fauri used his vehicle’s Grom to destroy an Israeli M60A1 tank and then knocked out a Merkava Mk. 1 tank with a Malyutka round. He later used his vehicles to reach and capture two ejected Israeli pilots after their Phantom F-4C jetfighter was shot down. The BMP-1 since saw action in dozens of wars and conflicts and was fielded by both sides in the Iran-Iraq war of 1980-1988. It proved reliable and easy to use but had significant shortcomings as well as strengths. Soviet and Russian veterans of the Afghanistan and Chechnya conflicts note the lack of side armour and the low efficiency of the vehicle’s weaponry in street battles and mountain conditions. More than 20,000 units were built and were used by around 50 countries, making the BMP-1 a truly veteran piece of equipment. Today it is outclassed by faster, better-protected designs, but it was the BMP that stormed the way for their development.